Springs: The springs for your garage are critical for providing balance throughout the whole framework. There are two types of springs in your garage setup. Next, Extension springs are the other component that is located on each side of the garage door. These springs are attached to the cables providing balance to the framework. Contact Garage Door Repair Miami today if you suspect your springs are worn and need replacements. Cables:: Another important part to pay attention to are the cables. When a cable tears, don’t try to operate the garage. This can cause severe damage to your garage including everything inside. Don’t try to fix them yourself as injury can occur. Call the experts at (305) 517-1295 and Let us help you! The core component that operates your garage from the touch of a button. Openers make life easy but, when they break down, it can ruin your whole day. Garage Door Repair Miami technicians are well skilled in the area of repairing any make and model of garage door opener. If you think your opener is the problem, give us a call anytime we are available 24/7 for our customers. The component that probably sees the most wear over time is the panels. Bad weather conditions can impact your garage door. 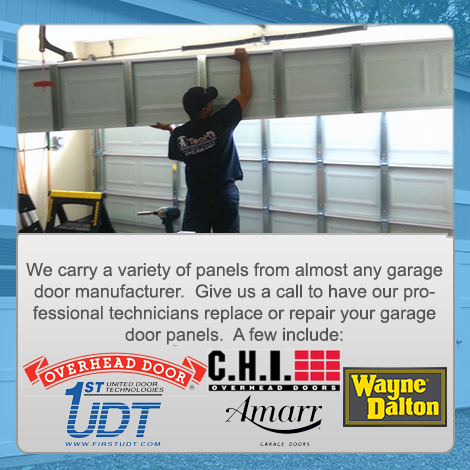 We carry a large stock of panels from the major garage door companies such as Genie, LiftMaster, and Chamberlain.